This project takes time and patience to complete, but don’t let the size scare you. It’s actually a fairly easy project. In fact, the video below has been seen by 1.4 million people, and thousands of people have used the pattern to successfully create their own lovable baby elephants. That means you can do it, too. This baby elephant pattern has been used successfully by hundreds of people from around the world. In fact, it continues to be one of the most popular projects on this site. Scroll down below the video to see just a few of the photos that have been sent in by people who used this pattern. 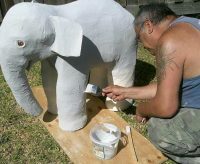 Watch the video below to see how to make your elephant sculpture. 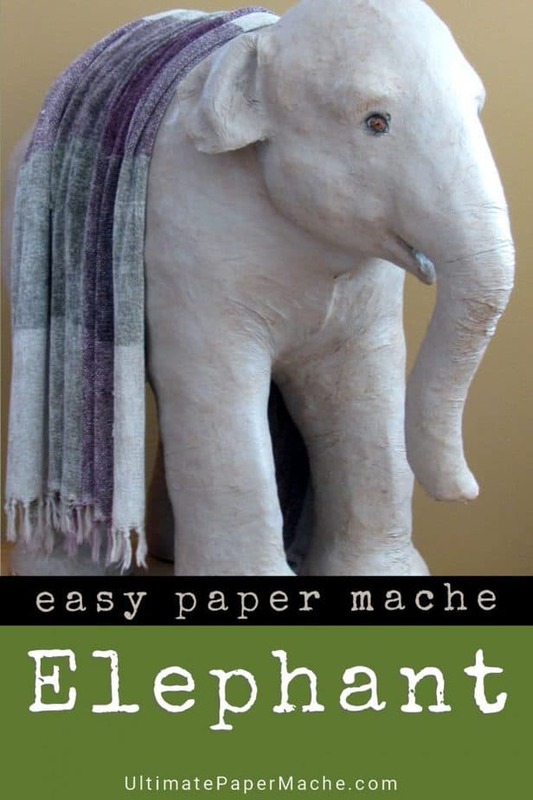 Note: I copied the pattern onto sheet of plywood, as you’ll see in the video, but if I made this elephant today I’d use a piece of cardboard from a large appliance carton instead. Cardboard is much lighter than wood. A large sheet of heavy cardboard or a scrap of thin plywood that’s at least 48″ square. 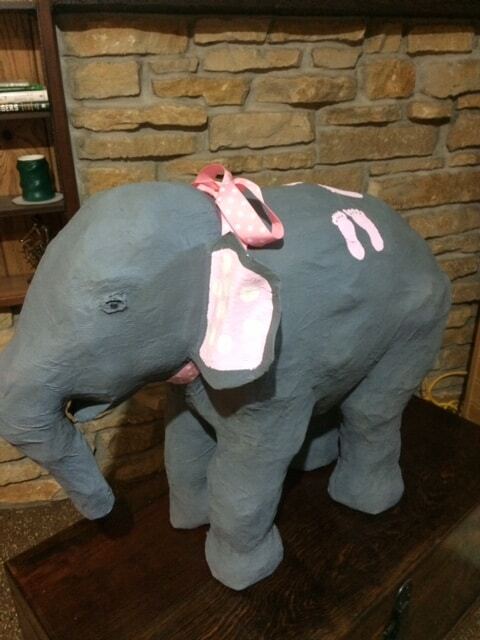 I didn’t invent my paper mache clay recipe until after I made this elephant. 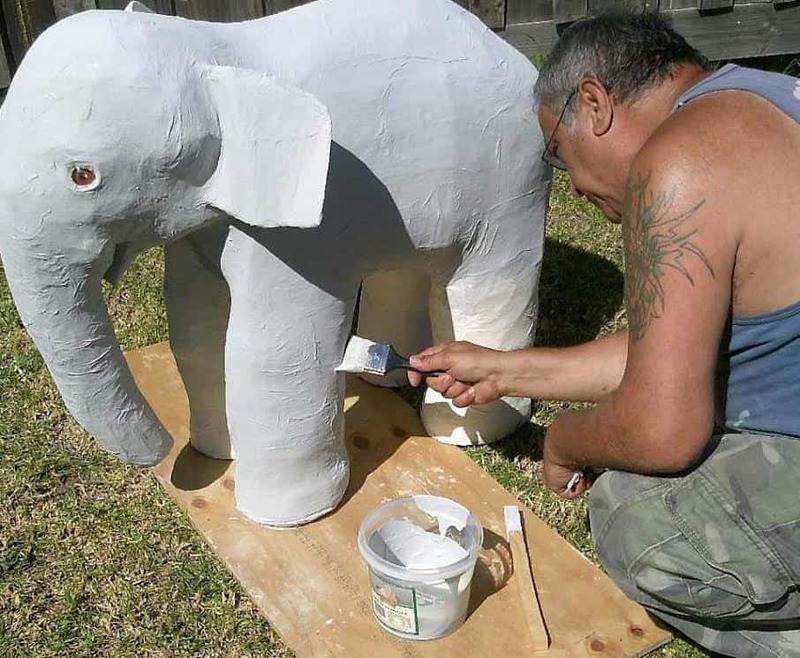 Since the paper mache clay goes on faster than paper strips and paste, I’d use the paper mache clay if I made another life-sized elephant. 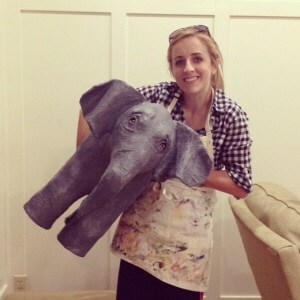 However, I’d still use the final layer of paper towels to get that realistic elephant-skin look. 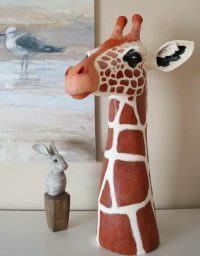 You can find the recipe for my now-famous paper mache clay in the Art Libray on this site. When I made my own elephant sculpture I thought a few coats of marine varnish would protect her from the elements. That’s why I took some photos of her out in the garden. I changed my mind after I did some experiments. 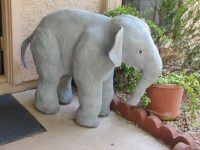 Marine (spar) varnish does not prevent rain and sun from destroying a paper mache sculpture, so be sure to keep your baby elephant inside. 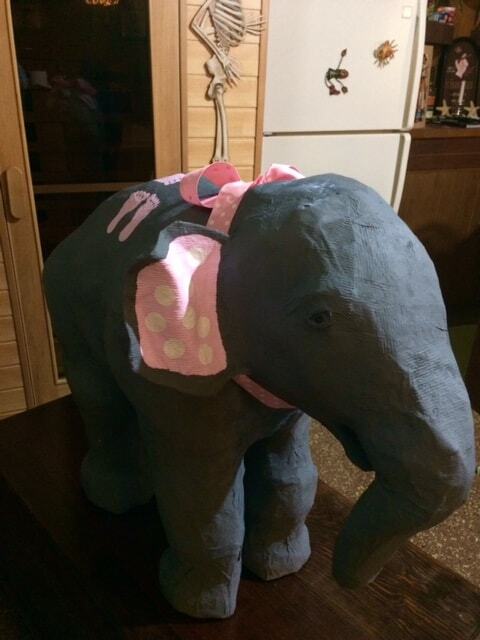 Elephant made for Lacey High School homecoming dance. 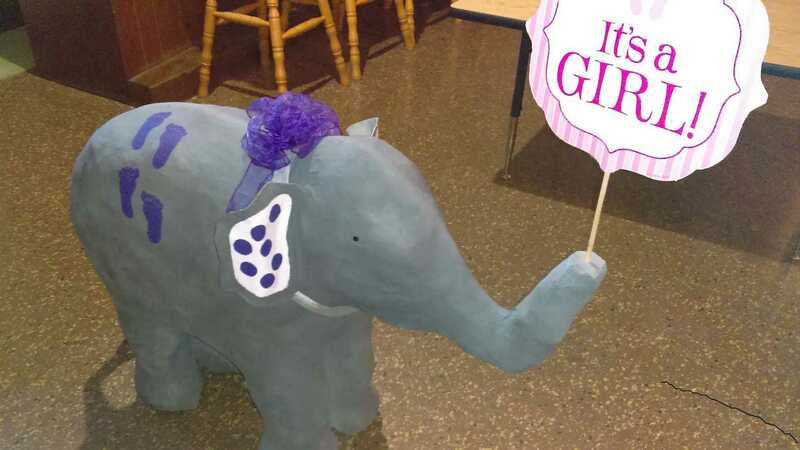 Judy Vretenar made this elephant for her daughter's baby shower. That sounds wonderful. I hope you’ll let us see them when they’re done. 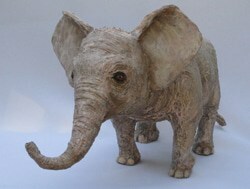 Looking forward to making an elephant head for my daughter… she loves elephants ? & her birthday is coming up! Will be using eggshells and tissue paper to give a realistic texture to the skin! & glass half marbles for the eyes! Thank you for the great pm clay recipe! I’m looking forward to using it so that I can make him look more realistic ??? 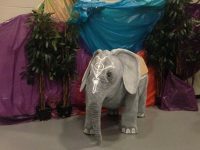 Each year I be decorating a temple festival hall.. every year I be making some types of elephants.. I really love your elephant..im going to try this for twin elephants at the entrance ..once done I will upload you..thank you so much for sharing this..
What a wonderful idea! I can’t wait to see how they turn out. sorry if this is a duplicate. I’m having trouble posting the picture. Hi Judy. Your image is probably too large. Did you see the two links at the very top of the page, before the comment section? One of them might help you reduce the file size of your image. I hope you try again! Judy, it’s beautiful. And what a nice idea, to use it for a baby shower. Where will it live after the party is over? Hi Judy. 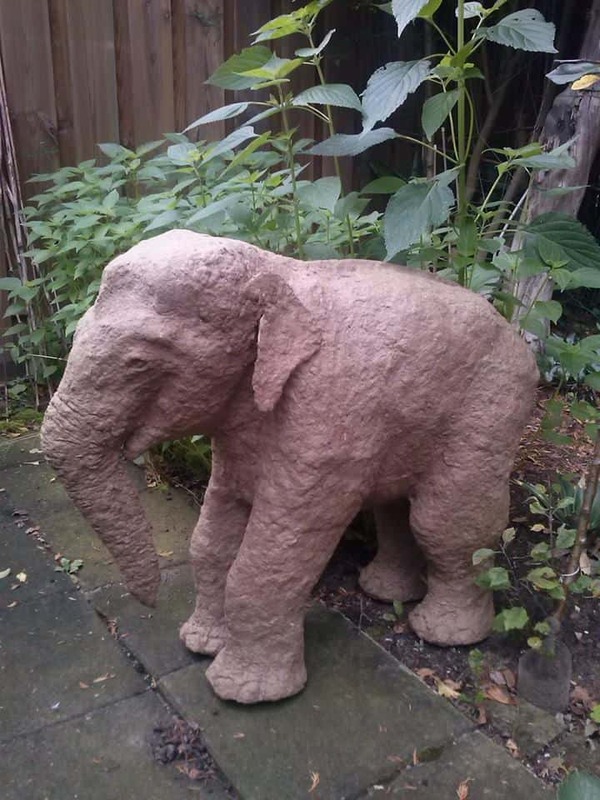 Did you try to send in a photo of Elephant #2? If so, it didn’t work. Please try to edit the photo to make the file size smaller, and give it another try. My first elephant. I wanted to make something for my daughter’s baby shower. My first elephant, never did this before. I wanted to make something for my daughter’s baby shower. I used a pattern made with sheet lumber. I would use a thinner plywood if I did it again, probably 3/8″ thick. There are a few scraps of 2×4 lumber for spacers, and the pattern is covered with crumpled paper and masking tape. Then that is covered with paper strips and paste, with a final skin made with kitchen paper towels, for texture. A piece of aluminum mesh is inside the ears, to support them, and the elephant was painted with acrylic paint. Nicely done! Congratulations – I know it’s a big project, but I’m glad you stuck with it. Do you have a special spot picked out for it? More importantly, does it have a name yet? 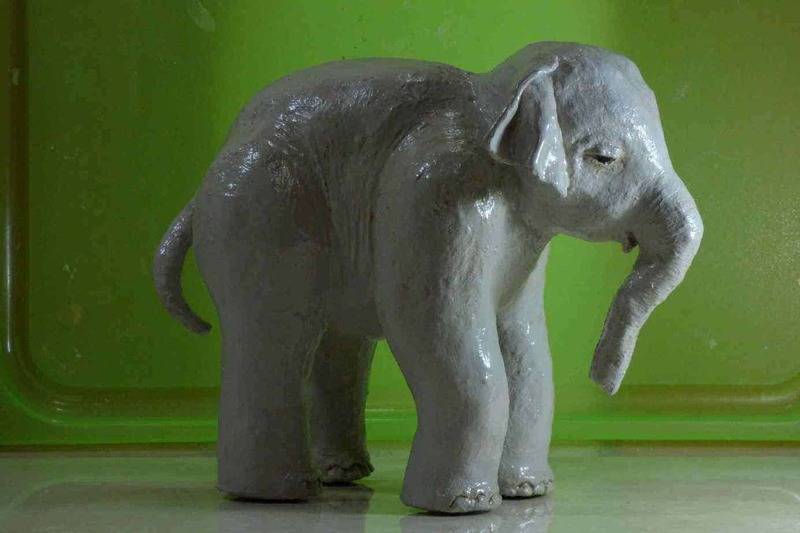 I look forward to seeing the elephant – is your daughter helping you, or are you helping her? And, more importantly, are you both having fun? 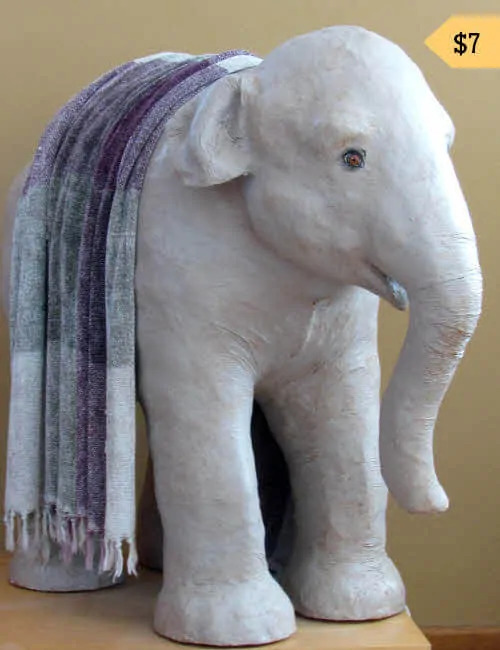 I just bought the pattern for the Baby Indian Elephant, but wasn’t sure how large your grid squares were when you transferred them to the particle board. It looked like they might be 2″ squares in order to get the 30″ elephant. Is that about right? Yes, I used two-inch squares. If you’d prefer an elephant in a different size, just divide the intended height with the number of squares on the grid – but I think the 30″ size is perfect. Big enough to make a statement, but still small enough so you can move it around. Have fun! And I do hope you’ll show us how your elephant comes out. How did you attached the ears? I forgot to put that into the video, so I added some instructions with the pattern. The hard part is keeping the weight of the wet paper mache from pulling the ears off the head before the paper mache has a chance to dry. You need a really big attachment area extending from the actual ear and spreading out over the side of the head. 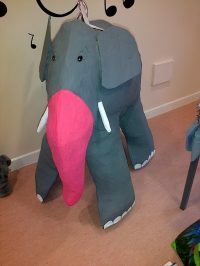 The extra material gets attached to the head first, with plenty of paper mache (if I did it again, I’d start by attaching the extra wire mesh to the head with hot glue, but I didn’t own one when I made my elephant). When the ears are firmly attached, you start adding paper mache to the actual ear, but just near the head. Let it dry, and keep working upwards. 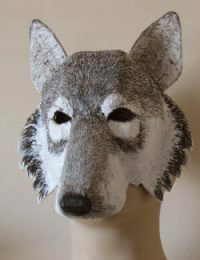 That way, the wet and heavy paper mache never has a chance to pull the ears off. Inside of ears are pink with white polka dots. Can you make a list of all the things you used to make this elephant, and step by step process? All the information you need are in the video and the pattern. I’m working on Valentine’s Day boxes for my kids, would Elmers glue paste stick to plastic and masking tape? I’ve never tried any kind of paste on plastic, but if you add the masking tape first, you should be able to use the paste to cover the boxes with paper mache. Try it, though – I’ve never done it myself. Hi Steven. Did you try to upload a photo of the item you made out of card board? If so, the image was too large, and it wasn’t uploaded. Please edit the image to make it smaller and try again. We would like to see it. This is incredible, not sure I could do that. 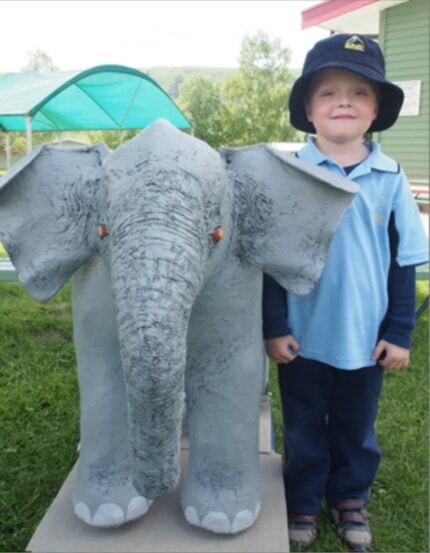 Here is Jazmyn the baby elephant. Thanks for making this video and sharing this project online. It took me a year and a month but it was worth it. Happy that John cheered me on. It gives us a laugh and it’s nice to have around the house. I had to go back to the drawing board and try steps over to get a good shape and we modified the ears. 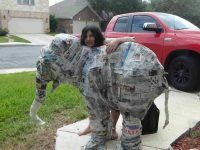 Look forward to more paper mache experiences. Keep up the good work. Glad I can finally share this with you. Hi Sparkle. Did you just now try to upload a photo? If you did, it didn’t come through, and I’d really like to see that elephant! Your photo was probably too large for the system, so I hope you’ll edit the photo to make it smaller, and try again. I truly admire your work and I am amazed by your talent (art)!!! I was just wondering if there was a way with this pattern to only make its head not its body??? Sure – just transfer the head portion to cardboard instead of plywood. 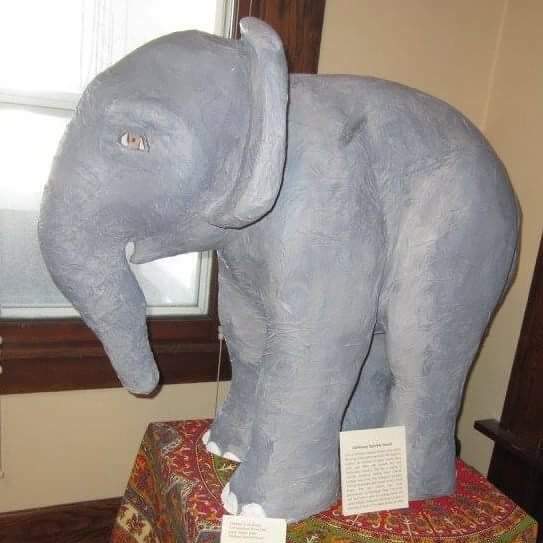 You would fill out the shapes of the head with crumpled paper, and build the trunk like I did, or use wire padded with more crumpled paper to make the trunk curve the way you want it to. 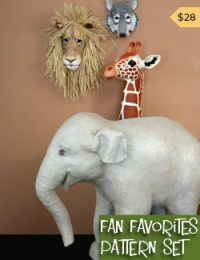 The other option is to use my 3-D pattern for a baby African elephant wall sculpture, which fills out all the shapes for you. You can find it here. There is a charge for that pattern, because it took me so long to design. Have fun! And come back to show off your elephant when it’s done. 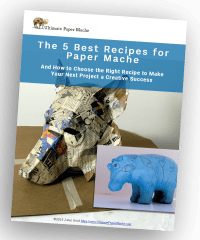 Is it possible to use cardboard or even card stock paper instead of wood? 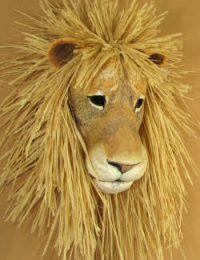 Also have you ever made a lion head video? Yes, you can use cardboard for the pattern instead of wood, as long as you don’t think anyone will ever sit on your sculpture. And I do have a lion head sculpture, but it was made with clay and then cast in concrete. You can see it here. The elephant is really nice !! Did you use wood?? 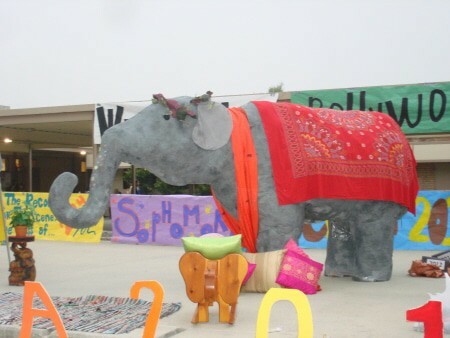 There is an elephant-shaped piece of plywood inside, and leg-shaped plywood. These pieces are used for the armature. This is shown in the video.